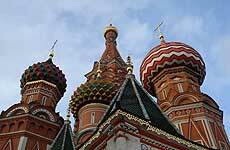 The Central Russian Language School is based in London and specialises in teaching the Russian language. You will be taught by teachers who are native Russian speakers and are qualified and experienced in teaching Russian as a foreign language. We offer a wide range of evening group courses at our school catering for all levels of Russian language training, from Beginners, through Elementary and Intermediates, to Advanced and Conversational classes. If you need to make quicker progress in learning the Russian language, we offer Individual Tuition and Intensive Crash Courses in a London location of your choice. Our students are motivated for business reasons, for holidays or simply because they love the Russian language. Find the right course for you by taking our Russian Language Tests. If you would like to enquire about our courses please call us on 07500 660 745 or send us an email at info@centralrussianschool.co.uk.